Perseverance or Patience in Business? One of my favorite books in the Bible is James. It's been called the Proverbs of the New Testament, probably because it contains so many pithy words of wisdom. How well do you deal persevere through adversity in business? If you're like me, not as well as you could! It's this: While Job was perseverant, he was NOT patient. (See Job 3; 12-1-3; 16:1-3; 21:4.) Yet, perseverance ultimately carried the day. Since childhood, we have heard of (and been lectured about) the patience of Job. Yet, instead of the patience of Job, it's more accurate to speak of the perseverance of Job. And perseverance, it turns out, was plenty. Job never stopped believing in God's ultimate goodness, despite what his circumstances and friends told to the contrary. As a result, God restored his material prosperity many times over, because "The Lord is full of compassion and mercy." Question: If the "patience of Job" is inaccurate, what other assumptions in business -- and in life -- should we question? Action: Pick one under-performing area in your business where you are tempted to say, "But that's the way I've always done it." Then, ask God to help you persevere to a new, better way of doing things. Good news: Do you find it hard to be patient with all daily setbacks that are inevitable in business? Me, too! But that's OK (as long as you don't explode at customers, employees, family, et al). All you need is perseverance. And, because "The Lord is full of compassion and mercy," if you ask, He will provide the perseverance you need to get through any problem and improve any situation. Think of a problem in your business. Not enough customers? The new product stinks? Your vendor just raised prices? Now. Ask yourself, "What should I do about this?" Then, pray about it. Yes, pray. Look up and ask: "God, what should I do about this?" Then, be still and listen. Okay. Got an answer? Or at least the beginning of one? Now that you know there's something you should do that would improve your business and your family's livelihood, are you going to do it? The answer could mean everything, in your business and your life. Why is it so easy to slip into "listen only" mode and avoid DOING things we know would improve our lives? Perhaps because the thought of solving a big problem all at once is too daunting. Taking comfortable, ineffective actions -- or no action at all -- is much easier. In his excellent book, 100 Ways To Motivate Yourself: Change Your Life Forever , Steve Chandler writes: "The next time you're worried about something, ask yourself, 'What small thing can I do right now?' Then do it. Remember not to ask, "What could I possibly do to make this whole thing go away?" That question does not get you into action at all." So, just for today, do one small thing. Take one action you know would improve your business, even though you know it won't solve all your problems. Call the last customer who had a complaint. Ask them how you could make things right. Then do it. Write a thank-you note to the 3 people who helped you most in your first 90 days of business. Tell them how thankful you are. They will be delighted and you will get an energy boost for at least an hour. Redesign your business card. I don't know what yours looks like, but it could probably be more compelling as a miniature receptionist/sales rep/brochure, which is what it really is. Click here for ideas. As these examples show, there are plenty of things you can do to improve your business. You can merely listen, and so deceive yourself. Or you can do something. Start by doing just one thing. Today. I'll write in the coming weeks about the importance of using contact management software in your business, SalesForce.com or Goldmine.com. For now, to help you understand how many good things can happen when you follow up correctly with prospects, let me show you what can go wrong -- terribly wrong -- when you don’t follow up right. Below is an actual email I got from a prospect who obviously never bought anything. I made just about every possible mistake with this man, all because I got lazy and didn’t use contact management software. My comments are in the body of his email message, IN ALL CAPITAL LETTERS. I did email him back with an apology and to wish him well, not to salvage this lost sale, but to try to head off any negative word-of-mouth. All in all, this is an excellent example of what can happen when you try to keep vital prospect details in your head, instead of in contact management software. It's axiomatic: If you run a business, you hate to waste time. I used to go crazy every time I got stuck in line at the post office or ran into a traffic jam. "I can't deal with this!" a voice would scream in my head. "I've got work to do!" Whenever I run into unexpected "slowness," like a long checkout line at Target, I pray something this: God, thank you for helping me use this extra time to find a valuable new idea! That idea may come quickly. Or a few days later. But a new idea to build my business always comes, because a prayer of thanksgiving like this is always answered (at least in my experience). 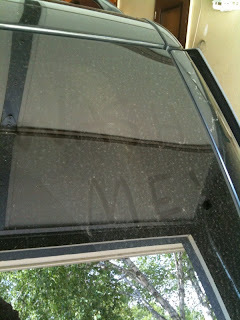 1) Two days ago, I twice tried to wash my car ... and failed. At left is a photo of my (still) dirty car. The first time, an accident closed the bridge across the highway to the car wash. The police turned me away, so I drove home. After dinner, I drove back, only to arrive one minute past closing time. No joy! As I turned the car around, I said, "OK, God. You don't want me washing this thing today. What new ideas can I come up with on the way home?" The answer was this: Instead of reading the newspaper, I should spent 30 minutes adding new keywords to the ads in my Yahoo Search account. Which I did. And guess what? Those keywords are on track to produce about $300 in revenue for the month -- $3,600 for the year. That's about a 15,000% ROI on a $25 car wash.
2) Back in March, I "fat fingered" a button on the ATM and withdrew $20 from the wrong account. Stupid! Now I had to enter that transaction later in Quicken, and withdraw another $20 from the right account. So I decided to use the extra $20 to invest in something to build my business. But what? The answer didn't come that day, so I put the $20 bill on my desk. 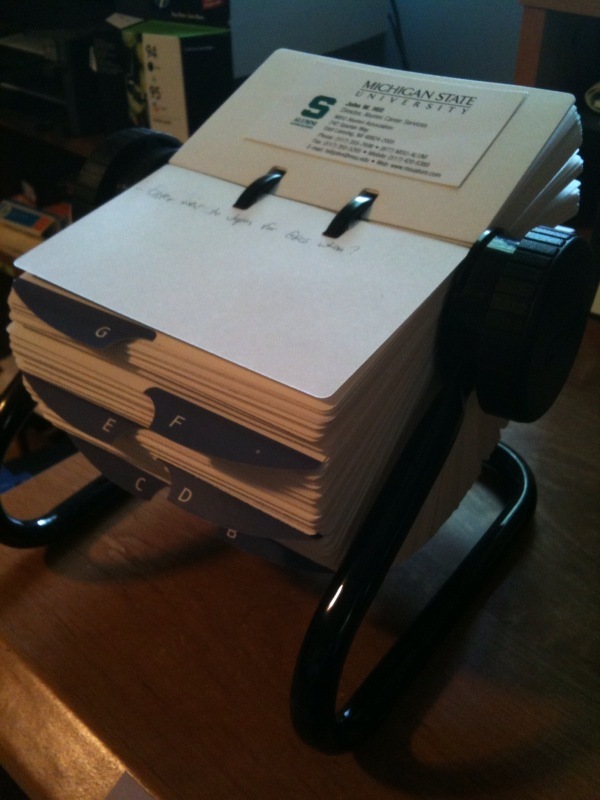 A few days later, the idea hit me: Buy a Rolodex file, to manage the hundreds of business cards I had accumulated over the years. A few minutes later, I bought one on Ebay for less than $20. And that Rolodex (shown at left) has helped me add at least 20 new people to my network, because I flip through it almost every day to review the names and make mental connections. Adding new contacts to my Rolodex is as exciting now as adding new baseball cards to my collection was when I was 12. Before, when those contacts existed solely in my cell phone, I profited far less from them. And I never would have bought that Rolodex if I hadn't decided to make productive use of a "wasted" ATM transaction. Question: How can you use your next bit of unexpected down time to build your business? God is patient with you. Be patient with yourself and with any situation that looks like a waste of time. With the right attitude -- and prayer -- you can profit from it. Where is Your Treasure in Business ... and Life? These words of Jesus are absolutely true. A modern-day translation might be: "For where your attention is, there your heart will be also." In our business, what do we pay the most attention to each day and week? If you track how you spend your time each day, in a small pocket notebook or online tool, as I used to, you will always be surprised ... and you probably won't like what you find. You probably spend more time on email than talking to your spouse or child, for example. More time watching TV than reading business books (or the Bible). More time driving than exercising (or praying). Note: I am the first to admit that I am guilty of all the above. Good news: Admitting you have a problem is the first step to solving it. That, backed by prayer, Bible reading, and right action, can solve any problem. Where is your treasure? Where should it be? How can you start setting your heart on it -- now? It's Monday, when we often struggle to get our minds into gear and focused on the workweek. As you probably know, about the worst thing you can do to solve a problem in business is to sit in front of a computer and stew over it. Not as a way of fleeing your problem, but as a way to get your conscious mind out of the way so your subconscious mind can solve it. And, as a bonus, you'll get some exercise. Don't have an hour or two free for a 5-mile walk? No problem. Fifteen or twenty minutes will do. I've found this simple solution never fails to invigorate both body and mind, while producing solutions to most of the toughest problems we run into in business. Try it today. Then, share your comments below. As a business owner, I've been very influenced over the past two years by the coaching I've received from Dan Sullivan and The Strategic Coach program. One of the key tenets of Sullivan's program is the idea of Free Days, on which you do nothing related to business. No thinking, writing, or acting on business ideas. You use a Free Day to rest and rejuvenate mind, body, and spirit. You may recognize the concept, which dates back about 4,000 years. It's called the sabbath. Today is a Free Day for me. Here's an idea that comes first for me today: Family. Question: How can you serve the LORD today by serving your family? Hint: By paying complete attention to your family members for just an hour or two, you will serve them, by giving them your most precious, non-renewable asset: your time. When you serve your family in a way that delights them and refreshes you, you will serve the LORD. Problems: Millstones or Stepping Stones? How often do you run into problems as you try to grow your business? Weekly? Daily? Every 10 minutes? Left unsolved, problems in your business -- like how to get more clients, or get them to buy more often -- can drag you down, like a millstone around your neck. But what if you looked at problems differently? What if you could see them, not as millstones weighing you down, but stepping stones, leading you on to success? It's entirely normal to look at a problem as a pain, something to solve and get out of your life as quickly as possible, like a toothache. Viewed that way, problems are entirely negative, like a millstone tied around the neck of a man who is thrown into the sea (Luke 17:2). But ... what if you viewed problems as the pathway to greater achievement? Because, you cannot succeed in great things until you succeed in small things. One translation of Luke 16:10 is, "Whoever can be trusted with very little can also be trusted with much ..." (NIV). What if you saw every problem solved as a stepping stone, leading from where you are to where you want to be? There will always be problems in your business. That won't change. But your attitude toward problems can change. Stop seeing problems as negative. That only drags you down. Start setting problems as a way to grow stronger and develop more skills. That paves the way for success in your business, like stepping stones to achievement.